All development for this project is happens on ‘mason_game’ branches in mine gsoc2009/alex-cyphesis.git and main ember.git repos at git.worldforge.org. I started to work some weeks ago and did a few things. To learn about representations of types, entities and scripts inside Cyphesis server, I decided to change starting place in the world. 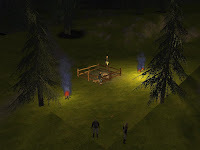 One thing for improve was the behaviour of campfires. With addition of proper dynamic lighting and shadows support in Ember we got nights to be dark. And having light source become essential to move without striking against the trees or being trapped by goblins. In default world, campfire starts with fire but it soon goes out without fuel. On the contrary, if some fuel added to it, then it lasts forever because there is no feature to remove objects when they are fully burned. So, adding some fuel from the start does the trick and sheds the light on starting point place. To let players have their own light source, I put two torches that players are free to take. Currently, Ember deserve some fixes to properly show the torch when hold by character. Also, in between, some fixes were made in Ember to finally finish the shadow shader. But this really is not part of GSoC. Next thing I made is rough implementation for rope making. I read a bunch of articles on rope making and history of agriculture to get some understanding of how they were making ropes in middle ages. Basing on this, I created a wiki page to collect info about farming in Mason. After that, added type definitions for correspondent tools and implemented simple task for making grass rope. It could be refined if that’ll be necessary. On the ongoing week, I’m not planning to code anything as I’ll have exam at the beginning on June, granting that I did some work earlier. Nevertheless, we will discuss next steps about next sawing task. I wouldn't mind composing a post or elaborating on a few of the subjects you write with regards to here. Again, awesome weblog! BlueHost is definitely one of the best web-hosting provider for any hosting services you require.